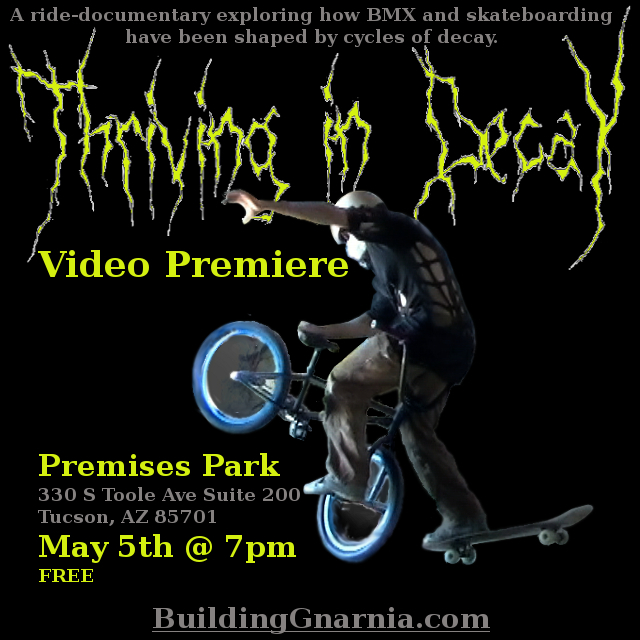 Thriving In Decay to premiere at Premises Park in Tucson! That’s right, Building Gnarnia’s second major installment is being released May 5th at Premises Skatepark! What started as a ride edit teaser has grown into a short documentary (hence no longer being labelled as “Project Teaser #2). It’s subject is the history of BMX and skateboarding, and the influence which large-scale cycles of decay have played on their development. This macroeconomic analysis of BMX and skateboarding is told simultaneously through commentary and the riding/skating itself. I guarantee that it’ll be unlike anything you’ve ever seen – Hope to see you there!